도선국사(827-898)는 신라말기에 활동한 선승으로, 남쪽지역의 비보사찰(裨補寺刹)로 ‘巖’자가 들어가는 세 절인 삼암사(三巖寺)의 하나로 선암사를 중창하였다. 도선국사진영은 두 발을 받침대 위에 올려놓은 의좌상(椅坐像)으로, 오른손에는 주장자를 세워 들고 있다. 옷주름의 표현이 특이한데 녹색장삼은 색의 농·담(濃·淡)으로, 붉은 가사의 옷주름은 먹선과 흰선을 중첩하여 표현하고 있다. 화기에 따르면 1805년에 도일비구(道日比丘)가 선암사 대각국사(보물 제1044호) 진영과 함께 중수한 것으로, 이 두 진영은 유사한 화풍을 보여주고 있다. 현존하는 고승진영 가운데 비교적 조성연대가 올라가는 작품으로, 함께 중수된 대각국사진영(大覺國師眞影)이 보물 제1044호로 지정된 바 있다. State Preceptor Seongak (827-898), also known as Doseon, was active during the last years of the Unified Silla Period. He founded three Buddhist temples with names sharing the letter am, meaning “rock,” in the southern region to make up for the region’s inadequate geomantic energy. Seonamsa is one of them. 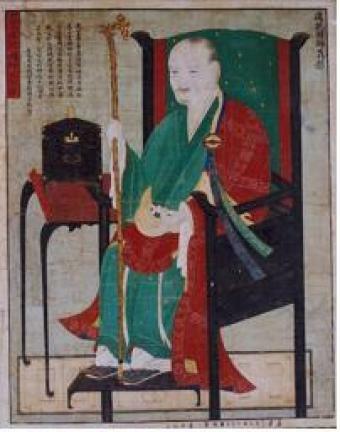 In this portrait recognized as one of the oldest portraits of a Buddhist monk handed down in the country, Doseon is portrayed sitting on a chair with his feet placed on a footrest and holding a staff in his right hand. The folds on the green robe are depicted with color gradation, while those on the red shawl are expressed with multiple lines in black and white. According to an accompanying record, a bhikkhu named Doil repaired the portrait in 1805 along with the Portrait of State Preceptor Daegak in the same temple, which is Treasure No. 1044. The two portraits are painted in similar style.